Why & How To Save For A Rainy Day? Session 3: Why & How To Save For A Rainy Day? 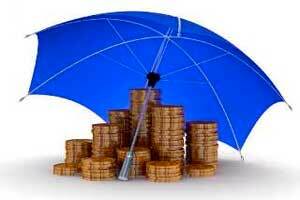 Saving for a rainy day is one of the key elements in the art of money management. As you know, life is full of uncertainties...and although we can't do much to avoid what's meant to be, it is wise to at least be prepared for unforeseen situations - meaning, plan for contingencies wisely. Situations such as loss of job, critical illness of a family member, debt-overhang or even a natural calamity amongst a host of others; can be stressful, both emotionally and financially. But when reeling under crisis situation, instead of wasting time on worrying and fretting, maintaining your calm and taking prudent steps can help tackle the predicament. In this session we'll discuss the importance of saving for a rainy day, and the approach you should follow. PersonalFN believes, while there are ways to deal with crisis situations, it is best to plan for them well in advance. This will make sure that your financial health is in pink in all circumstances of life. Contingency planning is based on the premise: Hope for the best and be prepared for the worst. While all may be hunky-dory with you currently, a short-sighted approach can bring in discomfiting times when exigencies crop-up. So, follow a far-sighted approach and ensure long-term financial wellbeing. We all need to provide for the future, and we need to account for uncertainties along the way through a contingency fund. You see, often there are financial obligations that are absolutely must to meet no matter what your professional or personal situation is. Loan EMIs are a prime example. This is why you must have a contingency fund (also known as contingency reserve). How Much Should You Hold As Contingency Reserve? Should it be Rs 2,000 or Rs 10,000 or should you save as per your ability? Well, what if you lose your job today? Will you be able to take care of your expenses at least for another 6 months? 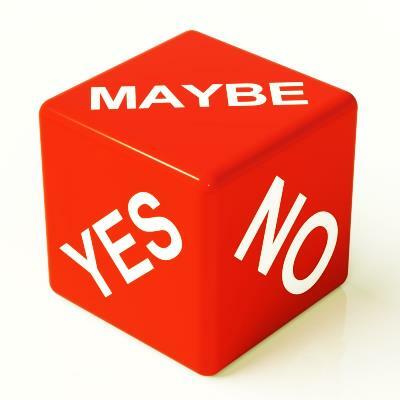 If "no", start planning for contingencies right away to weather any crisis that comes your way. This is how you plan your contingency reserve. The objective is: to maintain a sufficient amount in your contingency reserve. So while keeping money aside as a contingency reserve, you ought to prudently ascertain your expenses and liabilities, to plan effectively. If your regular monthly expenses (including EMIs) are Rs 50,000. The contingency reserve should at least be Rs 3 lakh and on the upper side Rs 12 lakh. Mr X is an IT professional serving as a consultant in an IT firm. He's worried about the slowdown in the IT industry and fears losing his job over the months. If he loses his job, the financial goals which he dreams of would go for a toss. And his big concern would be providing for day-to-day expenses to run a home including the EMI for a home loan. ...Totally amounting to Rs 55,000 per month, plus a few other unavoidable expenses. He should at least plan for 6 months of regular expenses, including EMIs, leaving him with a sum of Rs 3.30 lakh to handle contingencies, while being conservative the amount could go to the tune of Rs 13.20 lakh (recognising the job security). Just like Mr X, we all have financial responsibilities to shoulder, and we need to fulfil them come what may. And that's precisely why you should plan for contingencies wisely recognising your cash inflows and expenses to be defrayed therefrom. Remember that, even if you have sufficient amount of money in assets such as real estate, physical gold etc., it is extremely important to maintain contingency reserves. 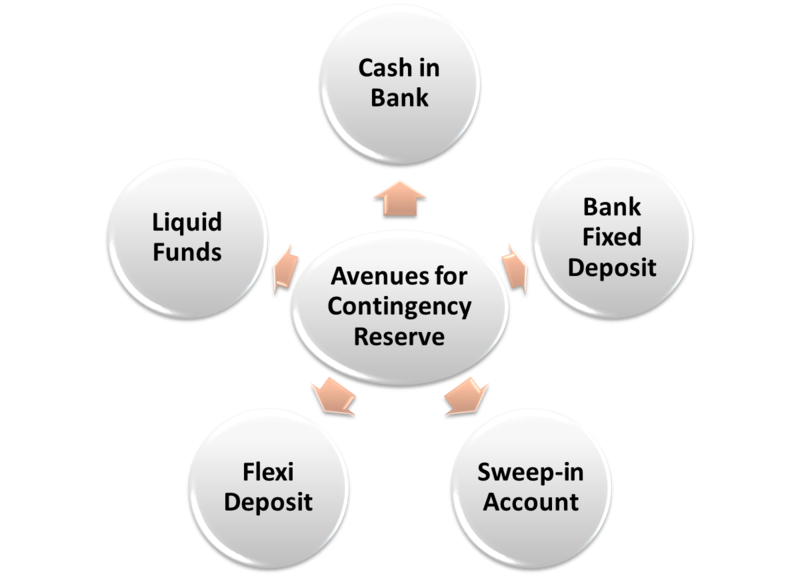 Cash in Bank - You can maintain a small portion of your contingency reserve in a savings bank account for liquidity, which can be accessed any time. This is next to having some money in your wallet. Bank Fixed Deposit - This would yield you a higher rate of interest compared to a savings bank, depending on the bank you choose. But thoughtfully select a bank and be mindful that interest earned on bank FDs is taxable. Sweep-in Account - If your bank offers this facility, to your savings bank account, you can set a threshold limit above which any amount deposited in your savings bank account will automatically move to a fixed deposit and earn a higher rate of interest prevailing on the fixed deposits. But ensure that the tenure for the FD does not exceed 24 months. Flexi Deposit - A flexi deposit is linked to your savings bank account and in case there is insufficient fund to clear your issued cheque; the deficit amount will automatically get transferred from your fixed deposit to your savings bank account. Both, sweep-in accounts and flexi deposits are convenient ways to manage your liquidity needs. But in case of flexi deposits, watch out penalty for premature withdrawals from the FD. Liquid Funds - These are money market mutual funds that invest in instruments with a maturity up to 90 days, and also invest in call money. They're safe and potentially earn returns a notch better than FDs and the money can be withdrawn within 24 hours on business days. 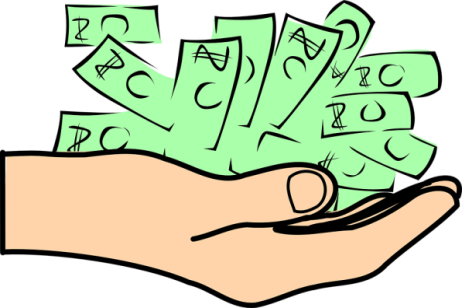 Reduce your expenses - Make a list of all your personal and household expenses. This will enable you to understand where to reduce your outflows. Cut out on the expenses on all extravaganzas such as eating out at expensive restaurants, movies, spas and so on. Explain the situation to your family members without losing your cool and encourage them to save money as well. Apart from luxuries, start rationing on comforts and necessities too. Reduce your electricity and telephone bills. Avoid frivolous expenses. Start using coupons, avail discounts and negotiate with the shop keeper when buying necessities such as groceries, vegetables etc. Plan all your shopping trips and outings in advance so as to save on transportation costs and switch to cheaper modes of transportation. Create a household budget and make sure that you and your family members stick to it. Find additional sources of income - Even if you are already working full time, this would help. Probably even monetise your hobbies and interests. You could also encourage your spouse to take a job if she / he don't already have one. This will increase the monthly inflows, which can be really helpful during a crisis situation. Make a list of your assets - This will help you assess which of them could be monetised for meeting your expenses. Check for any money that you have kept aside for such emergencies and use that first. Make sure that you only redeem those many assets which can generate enough money to meet your necessary expenses. Sell unwanted items - Over the years, we all accumulate a lot of items both personal and household, which we seldom use. They are kept in the storage forever and simply occupy space. You might consider selling unwanted items even if it fetches you a lower price than their cost; as this would enable you to accumulate funds and manage the dire situation better. But, in case if you have some antiques which you wish to part away with, consult an expert as this can help you fetch a good sum of money. Renegotiate terms with your creditors - If you are in a situation of debt overhang, it would be appropriate to reach out to your creditors and renegotiate terms with them. You can call them and explain them your situation. They might be ready to lower interest rates and / or extend your repayment tenure, thereby helping you to reduce your monthly payments. Save on interest payments - If you have too many debts, you must make a detailed chart including interest rate, tenure and default penalty etc. 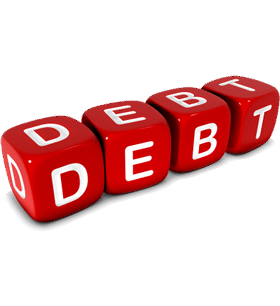 to understand which debt payments you must clear first. It would make sense to repay your high interest loans so as reduce the burden of high interest payments. Consult an expert - It would be prudent seek guidance from a financial planner or credit counsellor (in case you're in a debt-overhang) who can help you to get out of the mess and streamline your finances. They will be able to advice you on the path to take. However, you must make sure you seek advice from an experienced professional who has the potential to actually help you. Listen to the suggestions given by the expert, but take final decisions only after analysing the pros and cons. Don't fall into a debt trap - Exciting offers in malls and discounts entice us into swiping credit cards and purchasing things that we can't really afford. Credit cards charge high interest rates if we do not pay the dues on time. Likewise, having overdraft facilities from banks also give us the feeling of having access to huge sums of money. Debts should be taken only when you are certain that you will be able to service it. Have an adequate life and health insurance - Optimal life insurance cover, will indemnify risk to life in case of the untoward event. It will ensure that your family members have money to meet their day to day expenses and financial goals and do not face any financial crisis. 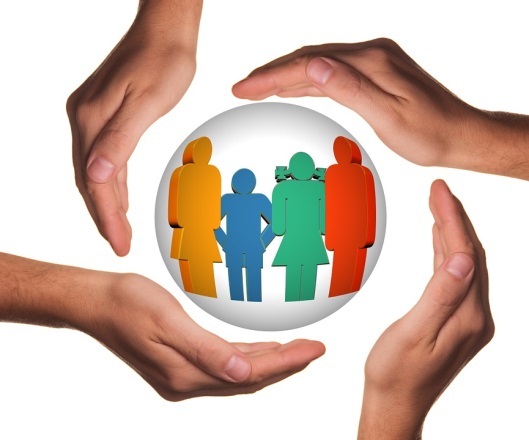 Also, as medical expenses can be very heavy on your pocket, it is essential to have an adequate health insurance cover for all the members of the family. Undertake financial planning - Through holistic financial planning you can take charge of your financial health and meet your long-term financial goals considering your investment objective, risk appetite, present income & expenses, assets & liabilities, amongst a host of other facets. Hope for the best and be prepared for the worst. Provide for a rainy day with a contingency plan in place. Your Contingency Reserve should at least be 6 months of regular monthly expenses, including EMIs, and conservatively 24 months of regular monthly expenses, including EMIs. Savings bank account, bank fixed deposits, sweep-in accounts, flexi deposits and liquid funds are good investment avenues to provide for contingency needs. Remember, a contingency fund is for emergencies; so returns are secondary. While calculating your contingency fund, it is important to account for all your liabilities. When in financial crisis reduce frivolous expenses, look for an additional source of income, take count of what you own, sell unwanted items, negotiate terms with creditors, save on interest payment and seek the services of experts. Avoiding getting into a debt-trap. Undertake financial planning holistically in the interest of your long-term financial wellbeing.